In a world where more than a third of college admissions officers visit applicants' social media pages and 93% of job recruiters review candidates' social profiles before making hiring decisions, a digital presence is now an essential for hopeful college admits, entry-level apprentices, and future employees alike. A decade ago, high school students were sent home with supply lists that included a backpack, binders, notebooks, and pens. Today, it is becoming increasingly important for a high schooler to come prepared with his or her digital records of achievement, including a LinkedIn profile, a resumé, and a digital portfolio. These tools increase a student's odds of success landing college admittance, job offers, and scholarships, interviewees told me. has had a LinkedIn profile for years. 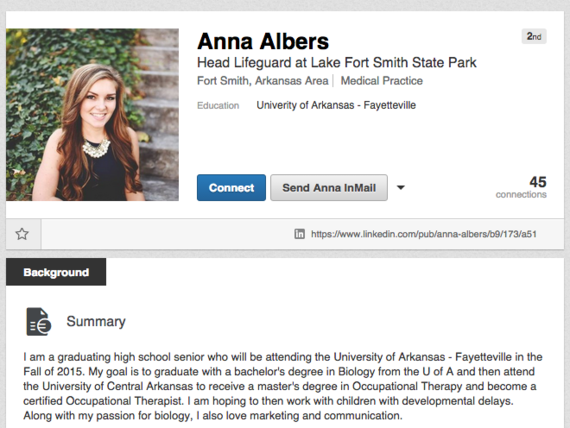 Anna Albers, an incoming freshman at the University of Arkansas has had a resumé since she was a freshman at Alma High School. For her, it's a tool for building credibility. She says what began as a homework assignment, grew into a useful resource for her career progression. It started as a place to list her extensive volunteering experience with organizations such as the Muscular Dystrophy Association and Ronald McDonald House, but now also showcases her academic achievements and work experiences. Her resumé, too, is highlighted on her LinkedIn profile, which she also launched as part of her course work at Alma, through a career-focused, co-curricular student club called DECA, which aims to "prepare emerging leaders and entrepreneurs in marketing, finance, hospitality and management in high schools and colleges around the globe." "My resumé has been incredibly useful," Albers says. "It helped me in the process of being elected and serving as a state officer for DECA. It also helped me get a job [as a life guard manager at a local state park], receive college scholarships, and push along my college applications." Albers says the hiring manager at Lake Fort Smith State Park, where she works, was surprised she even had a resumé. "It helped me gain the managerial position. Most high school and college students don't have a resumé," she says. "When I spoke with other applicants applying for one of the scholarships I ended up receiving, too, no one else had submitted a resumé and many didn't even know what a resumé is. The resumé, though, created the backbone for the interview and provided talking points for my interviewer." Albers assessment of her interview seems accurate, according to Chad Brown, president of the Harvard Club of Arkansas and director of research at hedge fund Circumference Group. Brown and fellow Harvard alumni conduct interviews with Harvard College applicants from Arkansas. He says he receives minimal information about an applicant leading up to an interview, including the interviewee's name, high school, and contact information. He typically requests a resumé during his first call with an applicant and later searches for the candidate on Facebook and Google to "see if there's anything of note," he says. "An applicant may be nervous or not know what Harvard is interested in knowing about them," Brown says. "Some students don't realize that what they're doing is different from their peers. When I find those details online, and they're not mentioned in the interview, I try to bring them up." Brown adds that students seem to be getting better at hiding their social presences. Which begs the question, why aren't more students aiming to showcase their digital goods? It may be because most colleges don't proactively ask for online resources yet. "For undergraduate admissions, we don't utilized LinkedIn or online portfolios to make admissions decisions," says Tyler Bittle, admissions counselor at University of Central Arkansas, noting that it's not part of the college's admissions rubric. "We look at transcripts and ACT scores. Supplemental materials become important when students apply to specific, more competitive academic programs, such as our Honors College," he adds. Bittle says even then, online resources aren't directly part of the application process, but they can come in handy for recommendation writers, who may use such resources to better articulate a student's accomplishments." Secondary educators, though, are stepping up to meet growing demand for online media. New York-based high school counselor Steve Brown forecasts, "In the next 10 years, you'll probably see more college admissions counselors accepting digital portfolios as a part of the application process to feel out what kind of a student body they want to bring together. Smaller private schools will likely start that trend, because a lot of them have already moved away from SAT and ACT score submissions. In the end, colleges want a well-rounded student body. Digital portfolios tell a student's story, beyond his or her traditional academic records." As recent high school graduate Albers puts it, "These digital resources are most valuable for high school students. A resumé is your foundation. It's what gets you started thinking about your passion and what you're doing in life. It's so helpful to have those conversations early on." Senior Jadon Barnes, for example, showcases his work via his professional-grade website and film reel, which showcases his love for and talent in videography. While still in high school, Barnes has already been a showcased filmmaker at the Little Rock Film Festival. It's easy to see why, when viewing his online footprint. Barnes' Twitter, LinkedIn, and Instagram profiles are also in line with his professional image -- something most adults can't say themselves! Professional videographer Lukas Deem, owner of Retrocat Media, commented on Barnes' portfolio, "His digital game is on point. Jadon's site showcases that he collaborates with other people and organizes his own projects. It shows that he's doing something outside of school hours -- which means that he's a driven individual." High school junior Bethanie Gourley, also a filmmaker, tells her story through a frequently updated YouTube channel and a digital portfolio. 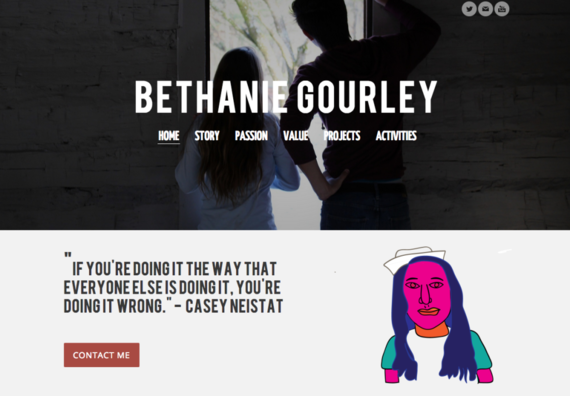 In fact, Gourley wrote a blog post last month about how her digital portfolio enabled her to connect with her favorite filmmaker, director and producer Casey Neistat, last year. "Through Twitter, I had tweeted him many times in the past," she writes. "But this time, he actually read what I had to say through my digital portfolio. The fact that Casey complimented my work showed me I had potential, even though I was just a sophomore in high school." An informative social media and digital presence is increasingly the make or break for college admits and job applicants. It's certainly a must-have in some circles. "We know applicants through their online presence weeks before we even talk to them," says Retrocat Media Creative Director Joe Lusby, who is currently on the search for a high school apprentice. He adds, "Everybody has social profiles these days, so we look for anything that stands out. Furthermore, if you don't have an online presence, we're not going to find you. Our business operates entirely online. That's how we network." High school counselor Steve Brown says he focuses his students' efforts on building digital tools that enable them to be better prepared for life decisions after high school. Based in Lake Shore Central School District in upstate New York, Brown has been helping students build digital portfolios for three years now. Using a tool called CollegeOnTrack, his students are guided through tutorials on building a resumé, creating a digital portfolio, choosing a career path, and researching college options. "From what I've found," says Brown, "Digital portfolios are a chance to highlight and tell a story about a student's growth and the things they do outside of school. I had a student who was very much into racing cars on the weekends. I had no idea, until he uploaded videos to his portfolio. He's now a student of engineering and diesel mechanics. I had another student who was a figure skater -- I learned through her portfolio that she volunteers for the Skating Association for the Blind and Handicapped, an organization that teaches blind children and adults how to skate on ice. As a counselor, it's helpful to see what the students do, and it's important for students to showcase these stories on college and job applications." Across the country in Michigan at similarly named Lake Shore High School, students -- such as Sean Neal, Jessica Old, and Caitlin Beirne -- use online site creator Weebly to create in-depth academic and professional track records of their work, including uploads of resumés, reference letters, academic awards, blog posts, and even work samples. For example, in her spare time, Beirne is a cake decorator and baker, and her work samples look delicious enough to prove it! These resources are just the type of content that recruiters and admissions officers cite as make-or-break assets. A video goes a long way in showing what a student has done and can do. Show me a picture of a delicious cake, and I'm ready to hire you for my next party! A digital presence is no longer a nice-to-have for high school students. 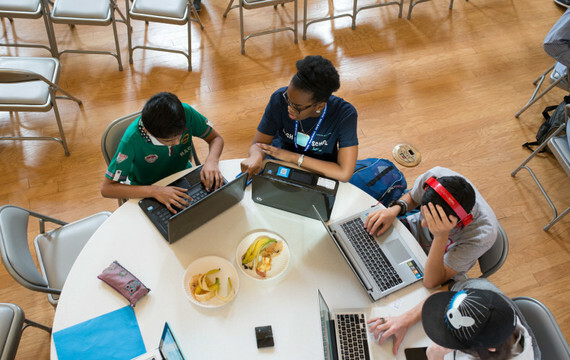 Competition is high, and schools across the nation -- and world -- are preparing their scholars for a 21st Century workforce. To students and the parents and educators who support them, I challenge: Is your digital presence ready for life after high school? These tools are the new high school essentials for those hoping to jump into a college program or the workforce. If you haven't considered building a resumé, LinkedIn profile, and/or digital portfolio to showcase your experiences, what's holding you back?